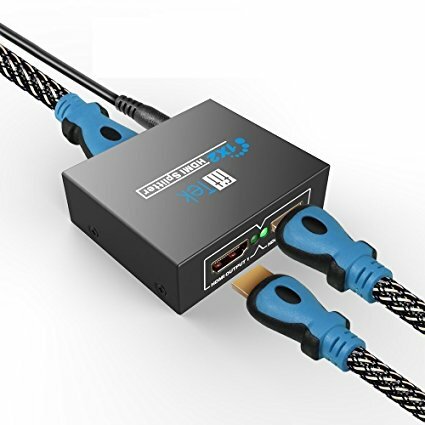 i just bought "fitTek Hdmi Spliter", i connected the input to my laptop via HDMI-HDMI cable and two outputs, the first via HDMI-HDMI cable and the second via HDMI-DVI cable. i can't seem to get a signal from the monitor connected with the HDMI-DVI cable, is it because of the cable? any tips? Short version: you need two HDMI displays for that kind of splitter. DVI is not the same as HDMI. A HDMI splitter is unlikely to have the required electronics to be able to output both HDMI and DVI compliant signals at the same time. While they are both similar signals HDMI is more advanced and a device outputting HDMI can "fall back" to DVI when it is detected. They are not the same and HDCP is not supported over DVI, meaning that a properly set up HDMI connection (required for Blue-ray playback) will not display on a DVI display. In order to display over DVI this "splitter" would need to process and strip out any HDCP encryption that is in place. There is also the problem that you are probably expecting this "splitter" to give you two independent displays, turning one monitor output into two outputs. This is not how these "splitters" work and they should more correctly be referred to as "replicators" as they simply repeat a single input across multiple outputs. Not the answer you're looking for? Browse other questions tagged multiple-monitors hdmi dvi splitter or ask your own question. How to connect between microHDMI output to a DVI-I dual link input? Can HDMI and DVI output different results?